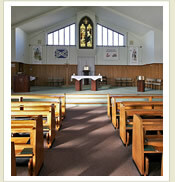 How do I arrange to get married in St. Dominic's? Couples request marriage after they become sure they love each another and have a desire to begin a family of their own. Marriage is one of the seven Sacraments and through the free exchange of vows spouses create an unbreakable bond with each other for the rest of their lives.